Environmental activists held a protest Wednesday in downtown Chicago to highlight a new report that links McDonald’s and Whole Foods to some of the worst-polluting companies in the world. The report, conducted by the environmental nonprofit Mighty Earth, found that both Chicago-based McDonald’s and the eco-friendly branded Whole Foods sell meat from agribusiness companies responsible for mass deforestation and pollution. In response, activists are calling on the two companies to establish environmental standards to clean up their meat supply chains. 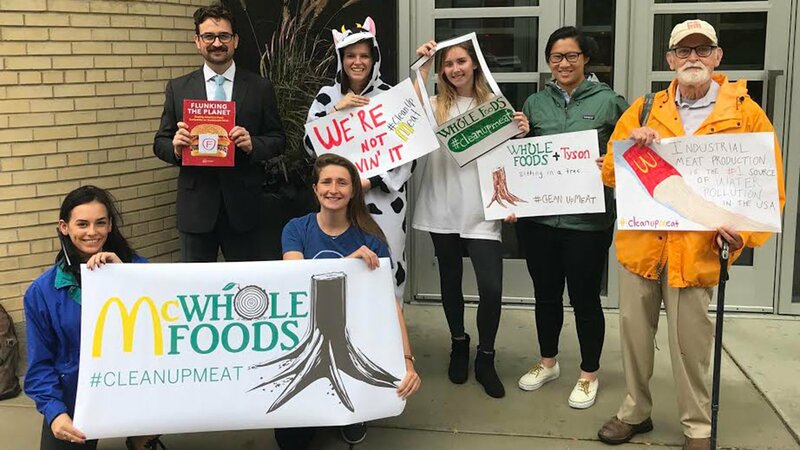 Protesters rallied Wednesday outside the West Loop office of meat company Tyson Foods, one of the suppliers identified in the Mighty Earth report. According to a separate report published in July, the world’s five biggest meat companies, including Tyson and U.S.-based Cargill Meat Solutions, emit more greenhouse gases combined than any of the major oil companies. Large-scale meat suppliers are also destroying native ecosystems as industrial agriculture expands into rainforests and prairies around the world, according to Mighty Earth. The new report, “Flunking the Planet: Scoring America’s Food Companies on Sustainable Meat,” examined 23 major brands representing the largest fast food, grocery and food service companies in the U.S. The report found that none of the companies have policies in place requiring even minimal environmental protections from meat suppliers. Even “green” brands like Whole Foods have failed to require environmentally responsible farming practices that protect drinking water, prevent habitat destruction and reduce emissions of harmful pollutants, the report found. In the report, Mighty Earth calls on companies to limit fertilizer use, replant degraded areas and take other steps to mitigate their impacts on the environment. A McDonald’s spokesperson said the company’s greenhouse gas emission targets include a 31-percent reduction in “emissions intensity,” or emissions per metric ton of food and packaging, across its entire supply chain by 2030 compared to 2015 levels. “We’re committed to leading industry efforts to collaborate with farmers on environmentally responsible crop production. Earlier this year we committed to support improved environmental practices on 2 million acres of by the end of 2020. This is the largest-ever land stewardship commitment by a U.S. protein company and represents enough corn to feed all of Tyson Foods’ annual broiler chicken production in the U.S., as well as some of the pigs and cattle the company buys from independent farmers and ranchers. “We’re making progress. This past summer we sponsored a summit that included more than 30 leaders of the corn supply chain, including professors from three major universities, representatives of the grain and animal agriculture commodity groups, seed and fertilizer dealers, the Environmental Protection Agency, the United States Department of Agriculture, the Environmental Defense Fund, and the Nature Conservancy. Of the 23 companies examined for the report, only Walmart received a non-failing grade, which Mighty Earth attributed to the company’s goal to reduce greenhouse gas emissions across its supply chain and ongoing efforts to improve farming practices for corn, soy and manure management. A representatives from Whole Foods was not immediately available for comment. Editor's Note: This story has been updated with statements from McDonald's and Tyson Foods.